"The land of Zebulon, and the land of Nephthalim, by the way of the sea, beyond Jordan, Galilee of the Gentiles; The people which sat in darkness saw a great light, and to them which sat in the region and shadow of death light is sprung up..." (Matthew 4:15-16). As the wise men saw the star in the east and came to worship Him, so shall they see the star again and come to sit at the Master's feet. In this hour I will pour out My Spirit upon all flesh and your sons and daughters shall prophesy. In the very places that have been scorned and looked upon with indignation I will now pour out a greater glory. From the studios and the marquee shall be seen, "King of Kings, Lord of Lords!" As all eyes were upon Me then, so shall they be upon Me now says the Lord. For in this Hollywood valley shall a great light shine, it will be seen from the nations and even the uttermost parts of the earth. For in this hour I will give them visions in the night and dreams upon their beds, and they will rise up to create and to perform in My name. They will capture the attention of the skeptic and the atheist and they will surely declare, "Jesus Christ is Lord!" A generation of outcasts shall arise from these streets like a star. When gross darkness covers the people, My glory will be seen upon them, kings will come to the brightness of their rising. The church will meet from house to house in Hollywood, in mansions and boxes will the gospel be heard. In the high places and the low My name will be heard. The sorrow of many will be turned to joy as My grace does much more abound. Media and MTV will hear the cry of My heart in this hour. I will capture the heart of this generation with their own sound, their own look, and in this hour you will find Me in the streets and alley ways with the misfit and scorned. My appearance will change and many will be surprised at what they see! 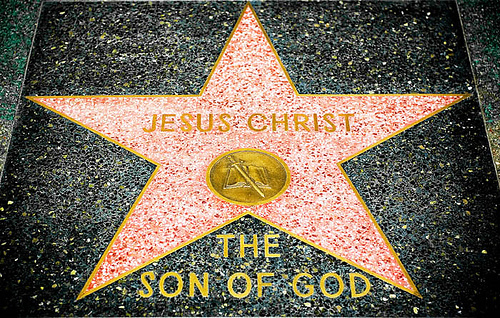 Many will come to Hollywood, not to be a star, but to see the Star, the Morning Star, the Son of Glory! "And they that be wise shall shine as the firmament, and they that turn many to righteousness as the stars forever and ever..." (Dan.12:3). I will find My sons and daughters on the streets of Hollywood says the Lord. I will leave the ninety nine for the one that is lost. I will sweep the house for that one piece of gold, I will give all that I have to purchase that field and pearl of great price. Many will see this and be glad. Many will remember the words that I have spoken over this place in days past, and like Simeon and Anna they will rejoice to see this day. They will rejoice to see the day of Lord. A sound will come from Hollywood, a sound so strange to those whose hearts are hard. A sound of deliverance and salvation will be heard. In the valleys and deserts a song will be sung, it will echo through the streets, and many will be saved. A song of Moses will be heard in the streets of Hollywood. "The Lord is my strength and song, and He has become my salvation; He is my God and I will praise Him..." (Exodus 15:2). A prophetic river will flow through this place and those captured by the allure of satan will surely follow Me. I will give them pure gold tried in the fire. A prophetic company will march through her streets and heal the sick and raise the dead. Heaven will visit Hollywood says the Lord. I will blow upon her streets and stages. In the most renowned and famous venues My name will be spoken and revered. I will upset and overthrow the influence of principalities that deceive and 'oppositions of science falsely so called.' I will topple the empires of satan that have flourished and prospered. And in their place a prophetic river will flow. I will deliver My sheep from the devourer. Like the two on the road to Emmaus I will open their eyes and their hearts will burn. Their hearts will burn with a revival fire that will light up the horizon, a city upon a hill that cannot be hid says the Lord! A city upon a hill that cannot be hid! A fire will be seen from afar, a great light and a visitation. Prepare yourselves O sons and daughters of destiny, My hand is upon you! My heart is towards you! My heart is towards you O Hollywood! Many will see it and be glad! Many will see it and be glad! (1st Timothy 6:20). "Heath Ledger, a DIVINE INVITATION to Love in Hollywood"
I live in Hollywood California, and when I found out the news about Heath Ledger I couldn't help but think and pray into the industry trying to get some perspective. From a Kingdom of God perspective, I just felt like we lost one of ours. I mourned and felt like this blazing light of an amazing young man was quenched. The bottom line is that Christians have a huge opportunity to learn how to love well in a land like Hollywood and in the entertainment industry. I don't know what condition Heath was in within his heart or what frame of mind he was in that night, but I can't help but feel if the church would love well, a man like Heath would have a chance to experience life that is truly a life worth living. GOD IS SENDING PEOPLE INTO THE ENTERTAINMENT INDUSTRY! "God said even as Anna Nicole died there is a reason. There is something that must be stated from the mouth of the prophet regarding this lady's death. For God said the whole Nation mourns, but I mourned long before she died. For she was crying out to me three days before she died. Crying out, God help me I'm lost, I'm stuck. Does anybody realize that three days before her death I was there by her side and I was touching the lady that they call Anna Nicole Smith. God tells you America, it shall also be a Anna Nicole Smith warning to many that I'm about to judge the perversion in this Nation. But God said I will show myself strong and raise up people like her to minister to those that are in the streets says the Spirit of God. There shall be a resurrection because the enemy took her but God said I received her into My arms..."